Even if there is no trigger mapping over your property you may still be in breach of the NC Act if you clear protected plants that you know are protected plants. The NC Act isn't the only act that relates to protected plants that may be on your property. The Commonwealth EPBC Act also covers plants that aren't on Queensland's Nature Conservation (Wildlife) Register. Being aware of the plant species present on your property is a key first step in risk management. ​Be aware that proposed changes to vegetation mapping in Queensland may change the way Protected Plant Trigger Mapping impacts your operation. Landholders may be unaware of a legislation amendment that came into force in 2014 to protect Nature Conservation Act listed plant species in Queensland. While it has been an offence for some time to clear Endangered, Vulnerable and Near Threatened plants listed under the NC Act there had, up until this legislation, been a less than rigorous approach to informing landholders of risks and of policing non-conformity. Landholders need to be aware of whether or not they have a trigger area on their property. Before clearing you will need to download or request a current trigger map. 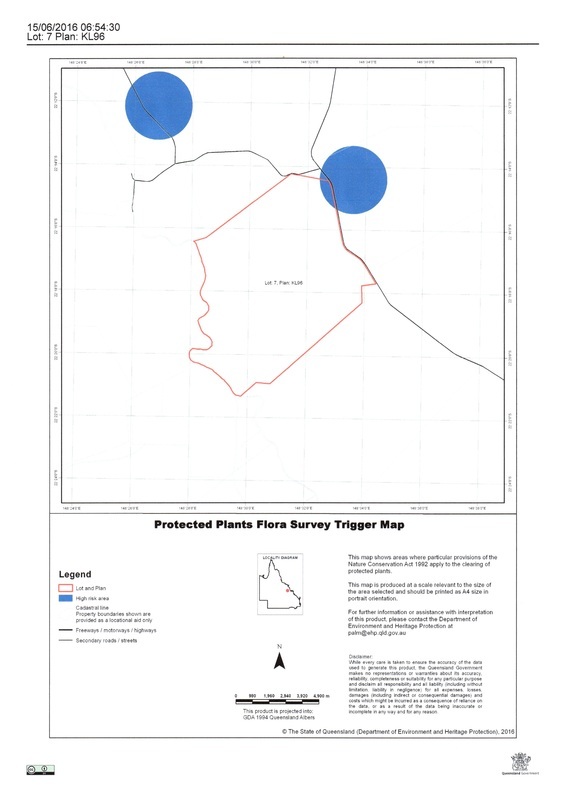 You need to log onto the trigger map website http://www.ehp.qld.gov.au/licences-permits/plants-animals/protected-plants/map-request.php and download the ‘Flora Survey Trigger Map for Clearing Protected Plants in Queensland' map for your property. You will need to enter the lot and plan for the clearing activity and your email address. When you are sent the map you need to work out if it intersects your planned clearing activity. You will get something like the PDF pictured (above, left) to check. Alternately you can request this map from your local DNRM office. You should not commence clearing before obtaining this map, even if you are confident that you don't have high risk areas on your property. Unfortunately, the paper copy of the trigger mapping is totally inadequate for accurate location of a trigger boundary in your paddock. If you have some GIS skill, the shapefiles for the trigger areas are available on the QSpatial website ( qldspatial.information.qld.gov.au/catalogue/custom/search.page) for download. Insert the search term Protected Plants Trigger Mapping and the data set should be at the top of the search list. Once downloaded they can be converted to whatever format you GPS unit uses. If you have any doubts give the DEHP a call on 13QGOV (137 468) to get some clarity around your specific situation. Stop work if you’ve already started the clearing activity. At least two weeks before clearing you will need to arrange a survey of the trigger area as it relates to your clearing intentions. This will need to be performed by a qualified botanist who will follow the Flora Survey Guidelines – Protected Plants methodology and who will provide you with a survey report at the end of the process. You will need this report for your next step. If there were no protected plants located by the survey, or if there are protected plants which are outside the clearing by 100 metres or more, you will need to complete an Exempt Clearing Notification – Protected Plants form and lodge with the department office. Once lodged you can complete the clearing activity. You must provide a survey report to chief executive at least one week prior to your clearing activity starting. If protected plants are located in the clearing area, or near the area ( within 100m), you will have two options: apply for a protected plant clearing permit with DEHP; or modify your clearing intentions. ​Landholders need to be aware that vegetation clearing enforcement is back on the government agenda again. Ignorance isn’t, and has never been, a defence in a court of law. Be aware of what you can and can’t do on your land. Having a PMAV doesn’t exempt you to legislation outside the VMA, even though it helps.